Deed research by Christina Wysocki. Old photographs are compliments of Betty Schuppert and son David. 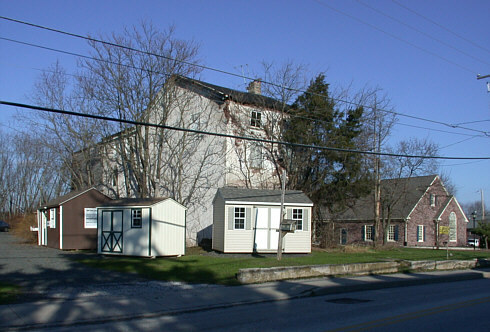 Composite photo of the Jacob Reiff Farmstead showing the barn in relation to the House. The house remains but the barn is gone. 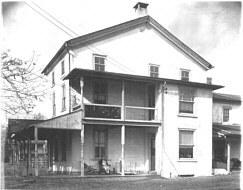 This view of the property is from where Harleysville National Bank is today with Skippack Pike (Rt. 73) just beyond the picture on the left. These two photos above show a side by side comparison of the Reiff house years ago (on the left) and today (on the right). This is a view from along Skippack Pike (Rt. 73) with Harleysville National Bank today behind us. This is a photo of what remains today (12/2003) of the Reiff Farmstead. This is a view from across Skippack Pike (Rt. 73) with the Harleysville National Bank just beyond the house. The scrub trees and wood sheds block a good view of the house. 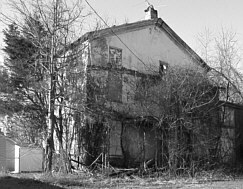 Location: Old vacant home on Skippack Pike (Rt. 73) west of Harleysville National Bank. Jacob Reiff's father was George Reiff who lived on a farm near Store Rd. and Kober Rd. in Lower Salford Twp., known as the Theodore Tyson farm in the late 1800's. His grandfather was Jacob Reiff, "who was prominent in matters of the Skippack Reformed church in the early settlement of the country", writes author Heckler. In 1725, the church was located at Morris Rd. & Upper Mainland Rd. in Lower Salford Twp. The church formation began earlier when Gerhard Indenhofen and other settlers started their own worship meetings in homes of members, at a time when most of the settlers were Mennonite. Jacob and wife Sarah Clemens Reiff had 8 children. They bought 141 acres, with plantation and buildings and improvements, from brother-in-law Jacob Clemens in 3/29/1800 who bought it 12/2/1796 from father Gerhardt Clemens (the grandson of the original settler Gerhart Clemens) and mother Catharine Hunsicker Clemens. Jacob Reiff was also the son-in-law of Gerhardt Clemens who had purchased this property from Peter Keiter in 1786. This land was originally of the settlers Gerhard and Eberhardt Indenhofen. It extended from Store Rd. to at least halfway to Forty Foot Rd., also it extended from a boundary approximately in line with Hallman Avenue and north to the Lower Salford Twp. line. 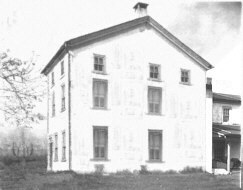 After purchasing the 141 acres in 1800, Jacob and Sarah sold 37 acres to their son Garret C. Reiff on April 28, 1827, "with buildings and improvements at the upper end of their farm", along the east side of Store Rd. It is the opinion that this land included the old stone house on Rt.73 near the NE corner of Store Rd., second from intersection. This house is believed to be that of the John Keiter family, constructed on his 64 acres purchased from father-in-law Gerhard Indenhofen in 1745. After Jacob sold his land and buildings to son Garret, in 1827, it is likely that Jacob had built a new home on his remaining land to the east of Garett's. This home being the vacant house to the west of Harleysville National Bank. He later sold this home and land to son George C. Reiff. As Heckler writes, "On February 16, 1833, Jacob Reiff and wife conveyed to their son, George C. Reiff, 68 acres with buildings and improvements". This tract was at the eastern border of the 37 acres along Store Rd. of Garret C. Reiff. Then, on April 1, 1867, "George C. and wife Elizabeth sold to their son Abraham D. Reiff, 45 acres containing the old homestead in good condition", writes Heckler. It is the opinion that this "old homestead" is the now vacant house to the west of Harleysville National Bank. And that the house had been built prior to the deed transfer of 1833 from Jacob to son George C. Reiff. This house may have been built about 1827 by Jacob as his home on the remaining land, after he sold the 37 acres with house to son Garrett. It also appears to have been the family home of George C. Reiff until 1867, and then the family of Abraham D. Reiff. Jacob died in 1853 at age 82 years. Burial listings 1852-55 of Upper Skippack Mennonite Church include a Jacob Reiff, "storekeeper", born 10/12/1770 in Lower Salford and died of "old age" 2/16/1853 in Perkiomen (aka Perkiomen-Skippack, before it was known just as "Skippack"), his wife Sarah was deceased, father- George Reiff, mother- Elizabeth Reiff. A research of the deed was done to give an indication of ownership. This parcel of land was in the Reiff family for over 80 years. 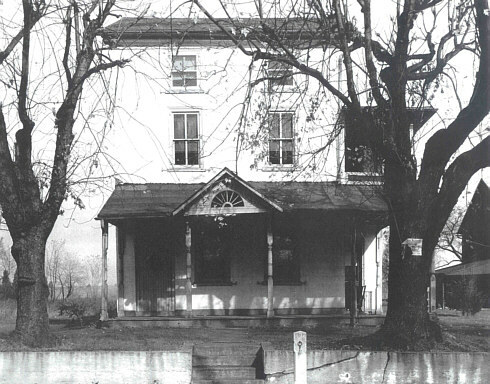 This is a view of the front of the house (along Skippack Pike) after some of the Victorian decoration and railings had been removed. The original house was probably built around 1827 and would not have included the front or side porches. You can see a little of the barn behind and to the right of the house. The house has a recessed doorway with beveled wood panels along the sides, and a transom above. This might not have been original, but a change added during a Victorian period, as was done to other old homes in the area. Porches were another feature added to homes, that began developing about the 1840's. There are additions to the rear, one being of brick, the other frame. A Skippack brick kiln was active until the 1840's. 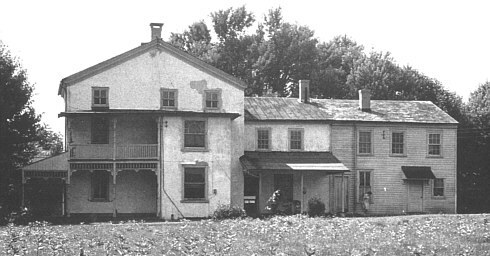 This view of the property is from where Harleysville National Bank is today with Skippack Pike (Rt. 73) just beyond the picture on the left. The center section of the house may have been the original house serving as a tenement before the main front section (on the left) was built in the Federal architectural style popular in the early 1800's. More details of the house came from a telephone interview with a former owner of the mid 1900's, who believed the house was at least 100 years old at the time they purchased it in 1943. The house was on 15 acres approximately. It has an attached summer kitchen. If given the proper attention, it is a home that would add a great deal of charm to the village. It is certainly one of the old, original "threads" in the fabric of Skippack village. These two photos above show a side by side comparison of the Reiff house years ago (on the left) and an idea of what it might have looked like in the early 1800's without the added Victorian porches & additions (artist rendition on right). It may have had a pent roof on the front elevation. The stone may not have been originally covered with plaster.